But large differences in wealth alone are proof of a “rigged” and unjust system, you say? They can’t happen honestly and without government favoritism? I strongly disagree. If I’m building a house and I don’t have a hammer, I have a good reason to go out and buy one. The owner of the hardware store I go to has ten hammers and is not building any houses. I pick out one hammer and buy it for $10. I make the trade of $10 for the hammer, because I value that hammer more than other things I could buy with the $10 at that time. The hardware store owner makes the trade because he values the things he could buy with the $10, more than that hammer. I value the hammer highly because I can’t finish my house without it. The store owner places a low value on the hammer because he’s not building a house, and he has nine more hammers. By trading, both I and the store owner gained value. The second fact that allows inequality to be consistent with justice is that the valuable goods and services around us, which constitute wealth, are not static resources. They are created from raw materials by human effort. 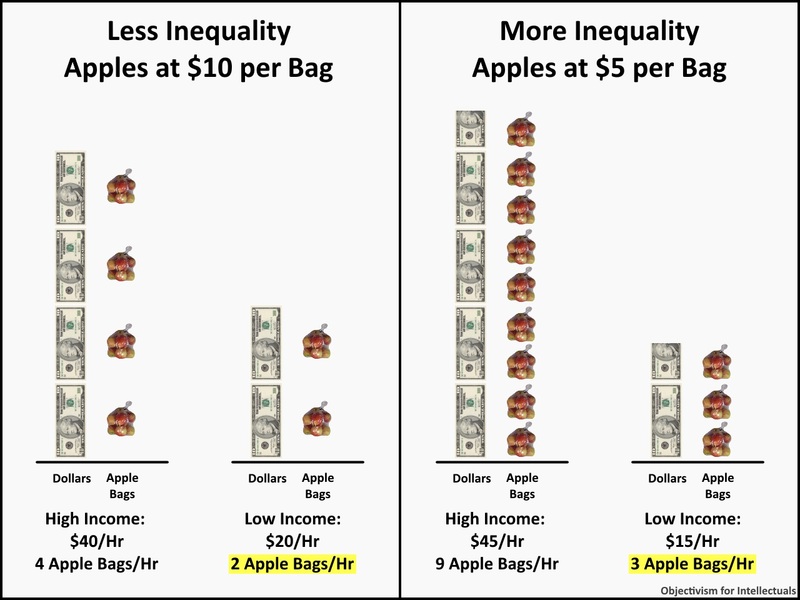 Differences in income can result from differences in how much wealth individuals produce. Different kinds of work can produce tremendously different amounts of wealth. (Generally, mental work produces much more wealth than physical work.) Under capitalism, those who produce more wealth for others get more in return. Higher productivity with a static money supply causes prices to decrease. This means that people can be better off while making less money per hour. So “the poor” can be better off with higher wealth inequality. In a free market, self-interested people will only make trades that they judge will have net benefit for themselves. If both parties to a trade are self-interested, and the trade is voluntary, they must make a win-win trade. If one of the parties is mistaken in thinking that they will win from the trade, then they bear the consequences of the mistake and this will give them incentive to learn and do better next time. If someone is really unfortunate and finds himself in dire straights, self-interested individuals will likely judge that he is deserving of help. [See: Other People as Egoistic Values Versus Other People as Objects of Self-Sacrifice in Ayn Rand’s Philosophy.] Help from friends, family, and benevolent strangers can distinguish between those who are good but just unfortunate, and those who are bad, irresponsible, or malicious. They will tend to judge who is deserving of help, and who is not. Government welfare doesn’t do that: it takes money by force from those who earned it and doles it out indiscriminately to those who didn’t, regardless of their moral character. To understand why government regulation inevitably breeds cronyism, imagine you’re a regulator. One of the qualifications for your job is a strong knowledge of the industry you regulate. So you probably worked in that industry for a number of years, and have some friends and connections in the industry. Now when one of your friends comes to you and says that this regulation, or that “possibly unethical” company is really hurting his company, you are put in a position of subtly favoring his company or harming your relationship with your friend. When new companies come into your industry with new people, new ideas, and new ways of doing things, your control of your industry is threatened. You haven’t developed the relationships with the company executives to know whether they will “play ball” with you. You haven’t developed standards to evaluate the new processes. You think that the disruption in your industry could severely damage the “public interest,” (whatever that is.) So you are hostile to revolutionary technologies and radical innovations. You regulate strongly in favor of large, established companies that have well-known people and well-known ways of doing things. This is why government regulation inevitably leads to cronyism. The solution is to free up markets. When the government is constitutionally restricted to merely being an arbiter that protects people’s rights against physical force, theft and fraud, it can be impartial. If the government is not empowered by the people to manage and maintain industries, government officials have no capacity to favor one company over another. Any attempts at cronyism would be obvious–as well as unconstitutional–and anyone involved could easily be caught and impeached for corruption. Markets can and do function very well without intrusive government regulation. The market for electronics technology is an excellent example. “Disruptive” innovations bring huge improvements for consumers and falling prices, not chaos and destruction. I’m running for President of the United States, and no president can wave a magic wand and make his or her vision for the country a reality. But my economic policy pushes in the direction of freer, more innovative markets and less cronyism. If you want honesty and justice in our governmental system–if you oppose cronyism and corruption–if you want long-term economic prosperity, you want more people in government with economic policies like mine. For everyone who is concerned with economic justice and wealth inequality, I recommend reading Equal is Unfair: America’s Misguided Fight Against Income Inequality by Yaron Brook and Don Watkins. This entry was posted in Economics, Politics and tagged Ayn Rand, capitalism, human rights, justice, liberty, morality, Objectivism, philosophy, socialism by Sword of Apollo. Bookmark the permalink.